Jonathan Rea has been linked with a switch to the MotoGP World Championship. World Superbike champion Jonathan Rea has talked down rumours that he could be in line to switch to the MotoGP World Championship next year with Suzuki. Rea, who won both races at Portimao in Portugal last weekend to put one hand on an historic third successive title, has a contract in place with Kawasaki for 2018 – the second year of his current two-year KRT deal. Kawasaki rider Jonathan Rea is within touching distance of a record third successive World Superbike title. However, that has not stopped speculation that he could replace Italian rider Andrea Iannone in the factory Suzuki team, who has struggled this season on the GSX-RR in the premier class. Rea said: “There has been no official communication between me and Suzuki and I am very happy here. “I have a contract for 2018 and so does Andrea Iannone. I presume the speculation is coming from Iannone underachieving but honestly I don’t have anything to say on this. “I am very happy here and my heart is in Superbike,” reiterated the 30-year-old. “The championship suits me very well, I’m on a winning package and to move to Grand Prix it would have to be on a winning package. “It would need to be an exciting project to make it worth my while because I know that I could go there and be in the front group if I had the right package. In 2012, Rea was drafted into the factory Repsol Honda team as a replacement for the injured Casey Stoner. He acquitted himself well with a brace of solid rides, finishing eighth at Misano and seventh at Aragon. 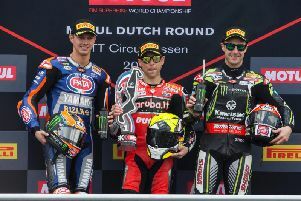 He has won 11 races this season and victory in race one at Magny-Cours in France at the end of this month would see Rea become the first rider ever to win the World Superbike Championship three times in a row.